Benjamin Barré, a genetics researcher who recently set up his own group at the University of Angers, is retracting four papers he worked on as a graduate student and postdoc. Olivier and I first became aware of problems with images of gels in some of the Figures in Dr Barre’s papers at the end of March, 2014. Although we initially thought these were isolated mistakes and that some errors had occurred during the editing of the figures, further investigations by ourselves as well as colleagues in Newcastle and Angers, followed later by EMBO Journal, revealed that this was a significant problem. As a consequence we realised that the integrity of these papers was compromised and there was no option but to retract these reports. We have been in touch with the relevant journals throughout this period. Dr Barre takes full responsibility for the problems with figures and has written to the University of Angers and affected Universities in the UK (Dundee, Bristol and Newcastle) to confirm this. However, he strongly insists that these problems were the result of careless mistakes. Consequently, investigations have started with an external committee in France (in Angers) as well as an investigation in the UK (jointly between Dundee and Newcastle) to determine if scientific misconduct has taken place. Before the results of these are known, both Olivier Coqueret and myself would prefer not to pre-judge the outcome of this process and so will not comment on this specific issue. We have recently become aware that there are a number of issues with figures from our 2010 Cell Cycle article entitled “Regulation of activity and function of the p52 NF-κB subunit following DNA damage” (Barré B, et al. Cell Cycle 2010; 9:4795–804; PMID: 21131783; http://dx.doi.org/10.4161/cc.9.24.14245). In Figures 1A, 2D, and 4B there are a number of duplicated or partially duplicated images of gels. The first author, Benjamin Barré, performed the experiments and assembled the data into the figures where these issues occurred. We have been unable to locate the original data associated with these figures, meaning that it has not been possible to verify the accuracy of these experiments. Consequently, in our opinion the integrity of the manuscript has been compromised, and there is no option but to retract the paper. The Perkins lab continues to work on the function of the p52/p100 NF-κB subunit and hope to publish work on this in the near future that will help clarify the significance of this pathway. “A cell cycle regulatory network controlling NF-kappaB subunit activity and function,” first published in EMBO Journal 2007 and cited 81 times, according to Google Scholar. “The Skp2 promoter integrates signaling through the NF-kappaB, p53, and Akt/GSK3beta pathways to regulate autophagy and apoptosis,” first published in Molecular Cell in 2010 and cited 46 times in Scopus. We’ve seen the notices for the last two, and they’re similar to the Cell Cycle notice. Unfortunately, as is often the case, the opacity of the JBC notice stands out. It seems unlikely the authors were willing to be forthright in the others and not that one, which suggests that the JBC has really limited the number of notices that will contain any detail. A lot of people seem to be trying to doing the right thing in a challenging situation here, but not the JBC. Of note: PubPeer discussion of the Cell Cycle paper began on PubPeer on March 23, which is when Perkins and Coqueret said they first became aware of the issues. At least one of the authors responded on PubPeer within a several days and said they had requested a correction. Ditto the discussion of the Molecular Cell paper on PubPeer. agreed an appropriate text for the retractions with the Editors of Molecular Cell and EMBO Journal and these should be made public in mid-July. Benjamin Barre has agreed to co-sign the retraction notices for Cell Cycle, EMBO J and Molecular Cell and also agreed to the JBC retraction. We have tried to be as open as possible with our institutions and the different journals during this period. If you have any questions or would like any details please let me know, although as stated above, we are now waiting for the results of the institutional investigations and cannot comment on that aspect the situation. It has recently come to our attention that two figures of Molecular Cell article (PMID: 20513428) contained duplication of images. The analysis of my other articles has shown that there were also errors in a EMBO Journal (PMID: 17962807) and Cell Cycle (PMID: 21131783) articles. This suggested that the data are false. For transparency and also to restore the truth, Pr Neil Perkins and myself have looked back the original data and it appeared that the errors come from the very early steps of the figure preparation process when original images were exported. We have contacted the editors of these journals to highlight the errors. In our letter to the journals, I have accepted the responsibility for the mistakes that were made in figure preparation and we have sent most of the original scans and repeats that we have preserved. In many cases, we have been able to find results from replicate experiments but unfortunately not all the original ones. Consequently, it has not been possible to verify the integrity of the studies and the retraction was inevitable. We deeply regret the publication of these errors and the embarrassment caused by this negligence. We found also inappropriate duplication of images in a JBC article (PMID: 12438313) published in 2003 when I was working as a PhD student in the Coqueret lab. Pr Olivier Coqueret and myself have alerted the editor of this journal about this error and I have tried to find back my original images. Although I found duplicates, I was unable to find back all the 12-years-old original results associated with the figures so, as previously, it’s not possible to verify the authenticity of the experiments. The credibility of the main result and conclusion were affected and the unique reasonable choice in this situation is the retraction of the article. I am sincerely sorry for this lack of rigor that is again the reason of the retraction. In total, 4 of my articles are affected by this negligence in the figure preparation process and are or will be retracted. While the overall conclusions of the manuscripts may still be valid, the credibility of these studies has been compromised to the point that retraction is warranted. I assume the responsibility for these errors. I know that they are not easily excusable but I am honest and I wish I will be able to prove it. For this reason, I am participating in an ongoing external investigation in my university. The first meeting has highlighted defaults in my data management and general lab organization. I just would like to add that I always tried to answer at all the requests with forthrightness and transparency in this difficult situation. Once again, I do apologize to the scientific community for these mistakes and I hope that future works will confirm our first observations and conclusions. Would Barré have been considered worthy to “set up his own group at the University of Angers” without those four papers on his CV? Prof Neil Perkins has 10 entries at Pubpeer. Some include Benjamin Barré, others do not. For example, number 4 below is with Y Revilla in Madrid, and does not include Benjamin Barré. Sometimes the data presentation may have small errors (some may even be debatable), other times the data presentation is more difficult to understand. Some of the entries go back to March 2013, before the first retraction in JBC was published. 7. Mol Cell. 2003 Apr;11(4):1043-54. 8. J Biol Chem. 2005 Mar 18;280(11):10264-76. 9. J Biol Chem. 2005 Aug 19;280(33):29728-42. 10. J Biol Chem. 2003 Apr 11;278(15):13431-41.
suggests that there may be problems woth data presentation in Madrid. I don’t buy the excuse that this is negligence. Duplications and partial dupications in 4 different papers suggest that, as the author admits himself, this is active falsification. Negligence may be nevertheless attributed to the PI’s, who realize these issues after years and hundreds of citations. Did they do everything they could to avoid this? Also, the fact the Barre’ is participating in an external investigation is quite worrisome. Agreed. The following terms are used by Barré… mistakes… errors… negligence… lack of rigor. These are all rather tame descriptors, associated with not paying attention. They imply a level of passivity, whereas the manipulations that appear to have taken place required conscious human input at several levels. The best possible outcome for the author would be the assignment of these manipulations to human error, in which case the question should really be whether tax dollars are best used to fund work by people who make a lot of mistakes? If I were one of the other candidates for Barré’s current post, one of the people stuck as a postdoc while he’s a PI, I would certainly be asking that question! I think “participating” is a poor choice of words by Dr. Barré. I would hope that “fully cooperating with” better describes the interaction. I also wonder if English is a second language for him from this sentence: “The first meeting has highlighted defaults in my data management and general lab organization.” – I assume he means “defects” or “faults.” I am encouraged that he is cooperating. The large number/frequency of issues certainly deserves close scrutiny. The key (unanswered) question remains: is this fraud or repeated careless practice. Good data management processes require a commitment to excellence on the part of each researcher in a group and a high priority set by the group leader and senior adminstration. Regular audits are the only way to ensure that researchers are consistent and how often does that happen in most labs? Perhaps a good time is at manuscript submission… I would think it would be appropriate that the principal/corresponding author certify that they have a compendium of all the data and code to support the manuscript and can establish the provenance of the data in the compendium. The journal could specify the retention period. Such a process would facilitate later inquiries. At Pubpeer I could find 5 entries about Skp2, the topic on one of the 4 retractions mentioned in the post. The first 3 below seem quite problematic. Lab books might fade, but still be available. Electronic documents, for example images files, should still be available. People used to keep autorads in ring-binder folders. The equivalent now would be electronic files from an imaging system. Often the computer attached to the imaging system will store the images. I don’t think the journals want to see the original membranes. When looking at old papers you are still allowed to use common sense. If it looks like a duplication it problably is a duplication. Electronic files should be stored in theory, but some cutting edge methodologies produce a staggering amount of raw data. An example: A single whole-mount 2-photon microscopy scan can easily take a terabyte of your HDD or even more if you use some super-fancy technique (see CLARITY, CUBIC, etc.). Thus, it is currently impossible to preserve the massive amount of data generated by this methodology in an economical way. Could you archive a copy of each scan compressed using a lossy technique (some kind of 3D JPEG)? Quality would be reduced but it would be good enough for the purposes of verifying claims made on the basis of the high-quality images? Better than nothing anyway. It is definitely worth considering. So far the routine practice was to take high resolution snapshots (preferantially TIFF format) from different angles and maybe exporting one or two fly-through videos. Let’s be specific. In this case the issue is about images from western blots. I don think they take terabytes. Don’t tax offices ask their citizens to be able to produce records up to…maybe at most 7 years? Aside from some narrow exceptions, the IRS period of limitations is three years. “Principle III. Verifiability. Whenever research results are publicized, it is made clear what the data and the conclusions are based on, where they were derived from and how they can be verified. J Immunol. 2008 Feb 15;180(4):2429-42. A238L inhibits NF-ATc2, NF-kappa B, and c-Jun activation through a novel mechanism involving protein kinase C-theta-mediated up-regulation of the amino-terminal transactivation domain of p300. Granja AG1, Perkins ND, Revilla Y. 1Centro de Biología Molecular Severo Ochoa, Consejo Superior de Investigaciones Científicas-Universidad Autónoma de Madrid, Madrid, Spain. A 2015 correction for figures 2B and 8E has been published for this paper. What about figures 4,5,6 and 9? The idea that researches should only be expected to keep original data for 5 years is ridiculous in the age of almost unlimited disk space. I have data that’s 15 years old which I could still access if needed. I don’t doubt that you not only can “access” it (in the sense of having it on a working disk) but actually use it with your current software. This isn’t the case for many other people, I think. 2016 retraction of 2010 review. Cell Cycle. 2010 Dec 15;9(24):4774-5. Epub 2010 Dec 15. Phosphorylation of the p52 NF-κB subunit. Benjamin Barré and Neil D Perkins, “P Phosphorylation of the p52 NF-κB subunit ” DOI: 10.4161/cc.9.24.14246. Cell Cycle. 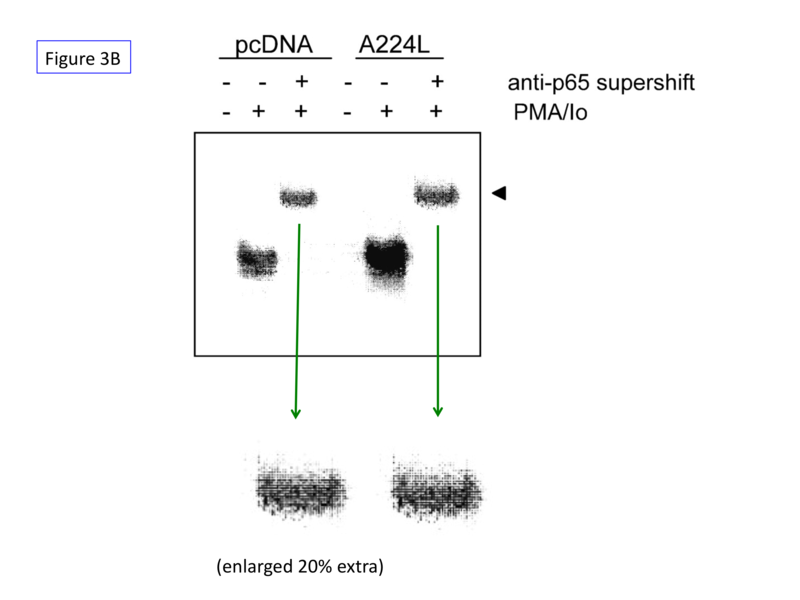 This article has been removed due to a number of issues with the original 2010 Cell Cycle article entitled “Regulation of activity and function of the p52 NF-κB subunit following DNA damage” (Barré B, et al. Cell Cycle 2010; 9:4795–804; PMID: 21131783; http://dx.doi.org/10.4161/cc.9.24.14245). This article is a commentary on the retracted paper detailed above. Consequently, in our opinion the integrity of the manuscript has been compromised, and there is no option but to retract the paper. We note we received, peer-reviewed, accepted, and published the article in good faith.